Banffshire & Buchan Coast MSP Stewart Stevenson has welcomed the announcement that several projects in the Banffshire & Buchan Coast area have been awarded funds under the Big Lottery Fund’s Awards for All scheme. People First in Fraserburgh has been awarded £4,820 to offer a weekly music class on Friday afternoons to adults with learning difficulties, as well as some additional one to one tuition. Meanwhile Friends of Buckie Guiding has received £10,000 to refurbish their hall and see a new, more efficient heating system installed. Cornhill Village Community Trust has been awarded £10,000 to complete the second phase of the refurbishment of the Hay Memorial Hall. This will see the original flooring replaced, the exterior stonework repointed and the original Victorian railings renovated. Additionally, Macduff Primary School has been awarded £8,951 to develop an eco-garden within the school grounds. “I am delighted that all four of these excellent projects in Banffshire & Buchan Coast have received funding from this round of awards. All four projects have in common that they are important parts of their local communities and I know that everyone in the local area will be delighted that they have successfully secured funding. “This funding will help to bring about significant improvements and will no doubt be warmly welcomed by everyone who is set to benefit from them. Buckie MSP Stewart Stevenson has welcomed the launch of a new publication which has been produced to help promote Buckie harbour and the surrounding area as a site for industrial development relating to the offshore renewable industry. “There is no doubt that offshore wind energy will become more and more popular in the coming years, with the Moray Firth in particular poised to see a large number of turbines developed. “Should that come to pass then I want to see as much benefit as possible accrue from those developments to the communities of the Moray Firth coast. Buckie is ideally located to provide an industrial base and provide a boost to the local economy. “I am delighted that the facility is now officially open. This redevelopment has been a long process but I hope that patients and health service users will agree that this is now a facility fit for the 21st century. The project to save Scotland’s red squirrels will continue for a further two years, Environment & Climate Change Minister Stewart Stevenson announced today. Saving Scotland’s Red Squirrels (SSRS) was a three year project, focussing on Scotland’s remaining red squirrel populations in the Highlands, Argyll, North East Scotland and northern Tayside. It ran from April 2009 to March 2012 and phase 2 of the project has been announced today. The new project will run for two years from April 2012. “Red squirrels are one of Scotland’s most recognisable and loved animals. The work of SSRS in raising awareness of their plight in north-east Scotland is extremely important to preserving their future. Today, there are between 200,000 and 300,000 grey squirrels in Scotland and only around 121,000 red squirrels. The new project will incorporate Red Squirrels in South Scotland and the fight to contain the threat from deadly squirrel pox disease in the Borders and Dumfries and Galloway. The SSRS project sets up targeted grey squirrel control in strategic areas in an effort to help red squirrels survive. Funding for phase two of the SSRS project is provided by Scottish Natural Heritage (SNH), the Scottish Wildlife Trust and Forestry Commission Scotland. Other funders are urgently required to ensure the long term success of the project and the survival of the iconic red squirrel in Scotland. “This is great news for the red squirrel in Scotland. By renewing the Project for a further two years, we are taking another step towards securing the future of this iconic species. “The Project has been a major success. With the Red Squirrels in South Scotland project, this is the first time that red squirrel conservation action at a national scale has been attempted. This project took potentially unpopular action that had no guarantee of success. It was a bold and visionary decision that the Project Partners and government ministers took. “With rural development funding we have galvanised a whole network of landowners to act in concert, which is the only way we stand a chance of retaining the majority of Scotland’s substantial remaining populations of red squirrels. “It has been a huge effort. Now we need to fine-tune it so that it can be financially sustained long term – and this is the job of the next phase of the Project. "We're delighted to continue supporting the Saving Scotland's Red Squirrel Project. During its first three years, the project has shown encouraging signs that targeted grey squirrel control can help safeguard red squirrel populations. We need to build on this success, finding out if control is sustainable in the long term, both to help protect red squirrels but also at a reasonable cost. "Part of the reason for the project's success is how it has brought together a wide range of people and organisations interested in red squirrel survival, including environmental bodies, land managers, volunteers and local communities, galvanising and co-ordinating action where it is needed most. In the next two years, the project will continue to prevent grey squirrels from spreading into the currently red-only parts of Grampian, Tayside and Argyll, as well as the core populations in the Highlands. It will also include work in South Scotland to defend red squirrel populations there from exposure to the squirrel pox virus." Primary school pupils are to get the chance to become detectives for a day as part of new wildlife crime education project launched earlier this week by Stewart Stevenson MSP, Minister for the Environment and Climate Change. The initiative, designed for primary school children, is aimed at raising awareness of crimes that threaten wildlife and the environment in the North-east. This project, unique to Scotland, centres on a new education pack, designed by Grampian Police in association with TAQA Bratani Limited, entitled ‘Wildlife Detectives’. It will feature five different activities including a CSI style Wildlife Crime investigation, DVD and team quiz. “Grampian Police Wildlife Crime Unit dealt with 306 incidents in 2011 ranging from salmon poaching to the illegal killing of birds of prey. Crimes such as these not only affect Grampian’s wildlife but can pose a threat to people accessing the countryside for recreation and can cause damage to land. “It is important that children understand how our countryside is managed for the benefit of both wildlife and people. The pack will help children differentiate between legal practices and wildlife crime. It is hoped the messages will be long-lasting, so in the future as adults they are able to make informed decisions about how they use our countryside. The education pack is expected to be rolled out to schools in early March 2012. The new packs are the brainchild of Andy Turner, the UK’s first Wildlife Crime Education Officer. “The fishing industry in Scotland has built up a reputation for following the rules over the years that has allowed the Scottish Government to secure agreement in Europe for us to try innovative new practices such as the Catch Quota Scheme. This reputation has come at a huge cost and after extreme sacrifices from the fishing industry and the communities that support it, as people in Banffshire & Buchan Coast know only too well. New flood protection schemes for Forres, Galashiels and Inverness have come a step closer today as part of the local government settlement for 2012-15. The three new schemes will receive support from the Scottish Government for up to 80 per cent of their total costs. Locals Authorities are yet to appoint project contractors but according to Minister for Environment and Climate Change Stewart Stevenson, today’s announcement will give assurance to potential bidders and residents. “This is great news for flood protection in Scotland, particularly for the three vulnerable areas who will receive this aid. We have listened to the concerns of local government and agreed with COSLA that this resource should be targeted towards major new projects. Following representations from local authorities about funding of large scale flood protection schemes, the Scottish Government and COSLA agreed that for the 2012-15 spending review period, the flooding component of the general capital grant should be targeted towards major projects. The distribution of this being agreed between COSLA and the Scottish Government. Banffshire & Buchan Coast MSP Stewart Stevenson has hailed the launch of a Scottish Arts and Cultural Digital R&D Programme as a valuable opportunity for Scotland’s arts and cultural sector. The program, which has been launched jointly by Creative Scotland and the National Endowment for Science, Technology and the Arts, aims to help arts and cultural organisations of all sizes from across Scotland develop further using new digital technologies. There is a £500,000 fund in place to support this work. This is great news for arts and cultural organisation in the North-east and across all Scotland. “The rapid development of digital technologies opens up exciting new opportunities for Scotland’s world-renowned arts and culture sector to reach new audiences and develop new business models. “I would encourage any local arts and cultural organisation to apply for assistance under this scheme before Friday 20th April. For further information and to submit an application, visit http://www.nesta.org.uk/digital_rnd_scotland. Scottish Land Fund launched to help rural communities buy land. The Scottish Land Fund which will help more rural communities buy their land was launched today by Environment Minister Stewart Stevenson. The £6 million scheme will empower more rural communities by helping them acquire land and make their dreams a reality. The Minister launched the fund - which will be delivered by Big Lottery Scotland and Highlands and Islands Enterprise - during a visit to Galson Estate which was today celebrating the fifth anniversary of its successful land buyout. "Galson Estate on Lewis, which today marks its fifth anniversary in community ownership, is a fantastic example of what a community buyout can achieve. "Community land ownership can bring tremendous benefits both to communities themselves and Scotland as a whole. Land ownership is key to building independent, resilient rural communities and creating a sense of confidence and community empowerment. "That's why the Scottish Government continues to fully support buyouts and is committed to providing opportunities for rural communities to acquire land. "The Scottish Land Fund, which we are launching today, is designed to give more rural communities the opportunities which communities like Galson have already enjoyed. "Both Big Lottery Scotland and HIE will ensure the fund makes the best use of existing resources and expertise to maximise the land fund's potential. "These are exciting times for Scotland and this fund will help more of our rural areas to take control of their own destinies and build the successful, flourishing communities of tomorrow." "We look forward to working with Highlands and Islands Enterprise to deliver the Scottish Government's new Scottish Land Fund. "Between us we have a wealth of experience in helping communities to take more control of their futures through the acquisition and management of land and land assets and we welcome the addition of the Scottish Land Fund to our existing grant programmes. Over the coming months we will work with HIE to develop a fund that will help to bring renewed momentum to community ownership across rural Scotland." "The new Scottish Land Fund will be welcomed in rural communities throughout the country, and Highlands and Islands Enterprise is delighted to be playing a part, along with our colleagues in Big Lottery Fund Scotland. "There's a definite appetite for this kind of assistance, and HIE looks forward to assisting communities across all of rural Scotland who are interested in making a land purchase. "With many years' experience in this field, we can offer valuable advice, information and support to help communities prepare their bids, and to design and deliver projects which will make the most of the assets they acquire." Loch Lomond & The Trossachs National Park has negotiated a £2m financial package with Scotgold Resources Limited, the company behind the Cononish gold mine, which will now allow the development to proceed. Planning permission was approved by the National Park Board in October 2011 for a 10 year underground gold mine facility near Tyndrum, subject to a number of legal obligations being secured. The National Park planning team has worked hard over the last three months to secure legal and financial agreements in order for Scotgold to start work this coming summer as planned. The financial package secured through a Section 75 legal agreement includes three bonds totaling £1.3m. The bonds will allow the National Park to enter and restore the site to an agreed standard at any stage of the development should the operator fail to meet defined obligations or abandon the site. The bonds include £950K to restore the landscape of the mine site, £160K for mining waste management and £222K towards The Greater Cononish Glen Management Plan, a 30-year native woodland regeneration project. The financial agreement also includes a commitment from the developer to contribute £325K towards other conservation and visitor projects in the National Park over the period of the mine. In addition contributions have been agreed from the developer towards the ongoing monitoring of the site by the National Park. A further pledge to donate £150K to Strathfillan Community Development Trust (SCDT) has been made by the developer and they have also agreed to donate a sum of £200K to SCDT as a contribution towards the development of a mining exhibition and interpretative facility. “Although the National Park Authority approved the planning application last year, we had to secure the legal commitments to guarantee mitigation of any adverse environmental impacts the development could have on the landscape as well as contributions to local environmental and tourism projects. I’m extremely proud of the work we have achieved in a relatively short timeframe which has also met Scotgold’s aim to start the development this summer. We have negotiated with Scotgold to make sure there are wider social and economic benefits for the surrounding communities. At the same time, we have established funding and guarantees that will deliver successful restoration and conservation of the landscape during and after the life of the mine. “This is a great example of how business can work with the public sector to facilitate a number of economic and environmental benefits ensuring the Park fully capitalises on the opportunities from the mine. “It’s great to hear that Scotland's first goldmine will be getting underway this summer in Loch Lomond and the Trossachs National Park. I commend the Park Authority for working so constructively together with the developer through this complex planning process and achieving such a good result. An initial application from Scotgold Resources Limited was refused in 2010. National Park specialists in landscape, planning and ecology worked closely with the developer to offer solutions mainly associated with the size and shape of the tailings management facility (TMF)and its successful restoration. The second application halved the size of the TMF with a redesigned shape to fit the landscape and significant amounts of mining waste being deposited back underground. The application also included a 30 year commitment to enhance the wider Glen Cononish through native tree planting and other landscape and habitat improvements. The approved application has over 60 conditions attached. The planning decision notice was issued after legal agreements were finalised. Forestry Commission Scotland is set to invest £4.5 million into boosting forest and woodland recreation in Galloway Forest Park. The plan is part of a wider tourism strategy to modernise the visitor experience and double visitor spending in the local economy by 2015. By upgrading a number of key visitor sites, the tourism draw will bring added benefits to the local economy. The funding will develop a new visitor complex at Kirroughtree, complete a major refit at Clatteringshaws and fund an upgrade at Glentrool’s centre. The tourism boost comes on the back of a recent £300,000 investment in the park’s walking trails and the successes associated from being awarded Dark Sky Park status. “The investment is a major commitment towards developing and supporting forest based tourism in and around the Galloway Forest Park. “The area has a fantastic reputation for its rugged outdoor landscapes and is a firm favourite for walkers, wildlife enthusiasts and mountain bikers. The Commission is to share their plans for Galloway Forest Park with key stakeholders and the community at information and discussion events held at Kirroughtree visitor centre this week. Main stakeholders have been invited to a morning meeting this Friday (17th Feb) and the public will be able to see plans that same afternoon from 2pm to 6:30pm. “Galloway Forest Park is the Commission’s biggest forest park in Scotland. Its forests, woodlands and moorlands are an amazing asset and are a key component in supporting the area’s tourism sector. The new facilities are due to be completed early in 2014. New guidance was published today by the Scottish Government and the Scottish Environment Protection Agency to ensure further joined up working between responsible bodies during a flood event. Flood Risk Management Planning in Scotland: Arrangements for 2012 – 2016 details the involvement of local partnerships and advisory groups, as well as the planned co-ordination with River Basin Management Planning and land-use planning. The guidance sets out the principal arrangements that will support the delivery of flood risk management at the local level. “We have made real progress in translating flooding legislation into action to reduce the damage and distress caused by flooding - including record levels of investment in flood protection by local authorities, the creation of a flood forecasting service for Scotland and research to improve our understanding of more natural flood risk approaches. “We now know the size of the problem we face as a nation. One in 22 homes and one in 13 businesses are at risk. Unchecked, we can expect climate change to increase the frequency and severity of extreme events including flooding. Flooding by its nature is too complex and its causes and consequences too complicated for any individual or single organisation to address the challenge alone. Proposals for the potential designation of Sound of Barra as a Special Area of Conservation (SAC) were debated in the Scottish Parliament today (February 8). In line with EU requirements, Sound of Barra is currently being considered as a possible SAC, as it includes a colony of harbour seals and sandbanks and reefs that are home to many marine species. Scottish Natural Heritage has carried out a consultation and their report and advice to Ministers is now being prepared. Environment Minister Stewart Stevenson met with Barra representatives before the debate, to discuss their concerns over possible socio-economic impacts on the local community. “Quite understandably the people of Barra are seeking to protect their own economic and environmental interests and, as such, are concerned by what the possible SAC designation may mean. What I can assure them of is that when I make my decision I will ensure that protecting local interests is a very significant consideration. “If I bring forward an SAC designation my objective is to do so when three conditions are met. Local people will be invited to participate in a management plan that protects local interests – including ensuring that a sustainable scallop fishery can be maintained in the area. “Furthermore, any such management plan would need to provide a continuing role for local interests in management of the area. And finally, the proposals progressed must conform to EU rules. 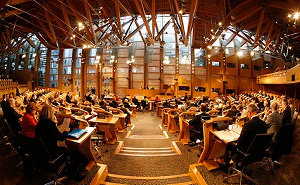 Banffshire & Buchan Coast MSP Stewart Stevenson has welcomed the passage of the Scottish budget for 2012/13. Despite the severe restrictions on spending caused as a result of the spending decisions made by the UK Government, the Scottish Government has made creating a jobs a priority through re-profiling £750 million from revenue to capital spending. In addition to this, funding is in place to continue the important council tax freeze and small business bonus scheme which are playing a critical part in Scotland’s efforts to boost the economy. The budget also contains measures to see the construction of a replacement prison in Peterhead and to build the AWPR once legal delays can be overcome. “Without the normal financial powers of an independent country, the funds available to the Scottish Government are determined by the spending cuts being made south of the border. This has meant some incredibly tough decisions have had to be made, but I fully believe that this budget has done everything possible to protect important measures and continue efforts towards economic recovery. “As promised during the election, there is funding to ensure that council tax remains frozen. Without this measure, an average band D property in Aberdeenshire could be paying £246 more than they were in 2008 when we first froze the tax. “The small business bonus will continue to ensure that thousands of small businesses across Scotland pay either no rates or have substantially reduced bills. 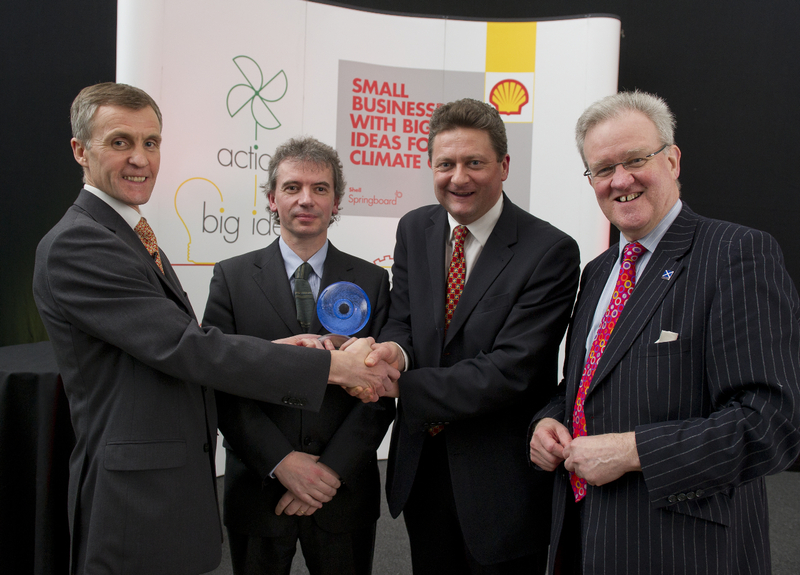 An Edinburgh business with an innovative idea to tackle climate change last night won a £40,000 Shell Springboard award. Celtic Renewables Ltd, a spin out company from Edinburgh Napier University, received a £40,000 Shell Springboard award for its process which generates next generation biofuels from by-products from the Scottish malt whisky industry resulting in reduced oil consumption and CO2 emissions. Shell Springboard is a Shell-funded UK Social Investment programme, which provides a financial boost to small and medium enterprises with innovative, low-carbon business ideas. This builds on Shell’s overall commitment to help the UK meet its future energy needs responsibly. “The Shell Springboard awards greatly encourage SME’s to be creative and seize the market opportunities presented by a low-carbon economy. I’m very impressed by the innovation shown through the low-carbon products and services entered for these awards; a wonderful showcase of technology and talent which I’m sure the judges had a difficult job choosing between. Cumbernauld based Gas Sensing Solutions Ltd (GSS) also received a £40,000 financial boost for its high performance CO2 sensors that can see users in the building control market reduce energy costs by up to 20%. Supply Design Ltd, based in Dunfermline, was awarded £30,000 for its high efficiency power conversion technology aimed at diverse markets including renewable energy, data centres and electric vehicles. Since its launch in 2005, Shell Springboard has judged over 1,000 entries and awarded approximately £2 million to 52 businesses across the UK. Overall, £330,000 will be awarded in 2012. This will result in a total of £2.25 million awarded over seven years to UK-based SMEs. This year, the programme received 130 entries, and 24 businesses have been shortlisted to present at three regional events across the UK. To find out more about Shell Springboard visit www.shellspringboard.org.uk. Environment & Climate Change Minister, Stewart Stevenson, today visited Dunkeld’s storm damaged Cathedral Grove to see how recently published guidance from Forestry Commission Scotland can help restore this designed landscape. 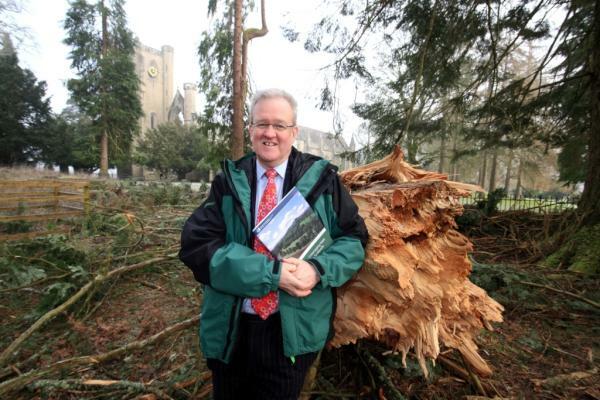 Sited on the Hilton Dunkeld House Estate, the 2 acre Cathedral Grove – which included many veteran trees – was badly hit during the storms of 8th-9th December. As well as losing several mature and veteran trees, the grove was further damaged by falling tree tops that had been snapped off in the wind. “Changing demands on landscape, increasing threat from pests and diseases and, of course, the impact of climate change and extreme weather events will all impact upon Scotland’s historic and much loved designed landscapes. “The damage here, at one of Perthshire’s best known heritage landscape sites, is very sad to see. This is an important tourist site but the Grove is also an important part of Scotland’s involvement in the world-wide iCONic project and to the developing National Tree Collections of Scotland. “With many standing trees no longer worth keeping and some of the damaged trees presenting significant safety concerns, re-planting a new generation of trees and rescuing the grove will be a formidable task. Outline the components of designed landscapes, in particular their tree features, their design principles and common management issues. “Designed landscapes are a significant asset for Scotland and it is often the trees - the result of careful species selection and deliberate planting over many centuries and at different scales - that shape and give the landscape its special qualities. They have artistic, historical and horticultural value, architectural, scenic, archaeological, recreational, educational and now also a climatic value! “The estate of Hilton Dunkeld House plays host to many wonderful examples of remarkable trees including the famous Dunkeld Pedestal Larch, the Parent Larch and the newly introduced Giant Redwoods. Banffshire and Buchan Coast MSP Stewart Stevenson has given his support for Safer Internet Day, which takes place on Tuesday 7th February. “The theme for this awareness day is Connecting Generations with the slogan 'Discovering the digital world together safely.' This topic looks at the reach of the online world across all generations and cultures and encourages families to work together to stay safe online. “Our offline and online worlds are strongly connected with the online world being a unique arena where people of all ages can learn together and from each other. “It is important to remember that we all have a role to play in ensuring that every child is safe online." MSPs will be invited to share their hopes for the environment at a ‘dream catching’ event in Holyrood today. CIFAL Scotland – a UN affiliated sustainability training centre, based in Moray – aims to record the views of MSPs to mark the 20th anniversary of the landmark Earth Summit in Rio de Janeiro in Brazil in 1992. The summit was instrumental in pushing climate change up the international political agenda and eventually gave rise to the Kyoto protocol, aimed at reducing Co2 emissions. Now, twenty years on, campaigners in Scotland hope MSPs will support their call for more action on climate change, poverty and sustainable growth. The Green Dreams campaign is part of a global effort to record the hopes and dreams of men, women and children worldwide on issues such as health, air quality, community, transport, energy and climate change, ahead of this year’s UN Conference on Sustainable Development – also known as RIO+20. Scottish Environment Minister Stewart Stevenson MSP has already recorded his green dream, warning of the impact of climate change on sub-Saharan African and other parts of the world threatened by desertification and rising sea levels. May East, chief executive of CIFAL Scotland, said she hoped the Minister’s backing would encourage other MSPs to support the campaign. Meanwhile, more than a dozen MSPs have backed a Motion in the Scottish Parliament tabled by South Scotland MSP Aileen McLeod welcoming the launch of the Green Dreams campaign. “Climate change is one of the few issues that affects every man, woman and child on the planet. Important steps have been taken by Governments from across the world and we don’t need to look much further than our own here in Scotland to see the emphasis being placed on reducing our own contribution to greenhouse emissions. “I am delighted to host this event in parliament today, giving politicians and the public a chance to share their green dream ahead of Rio+20. My own green dream is for all governments, regardless of size or political persuasion uniting in agreement to reduce their own nation’s carbon footprint and I remain hopeful that this can achieved in Rio in June.